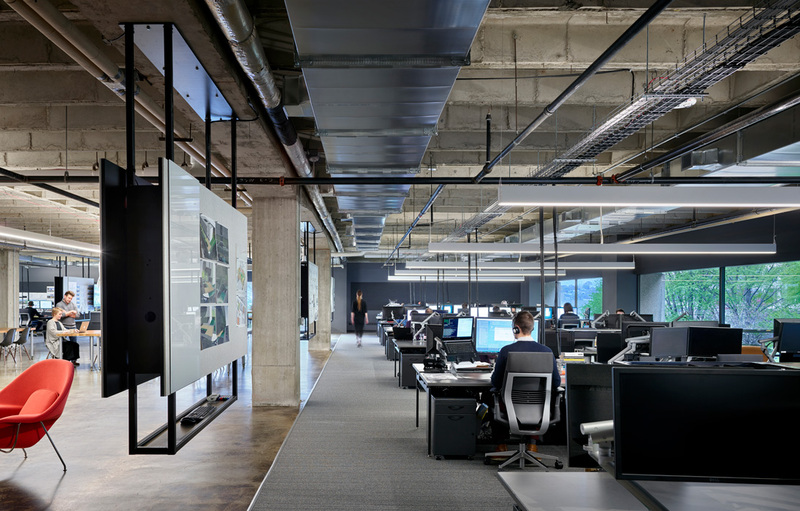 When the BNIM architectural firm took up residence in a new space last January, it marked the end of an unfortunate chapter but also what now seems like a thrilling new beginning. BNIM’s relocation and office renovation . . . . has sparked another evolutionary step in Crown Center’s identity. In the midst of a community dispute over public tax subsidies for developers, the firm had been forced to abandon its ambitious plan to lease and remake a drab Crossroads Arts District warehouse into a sustainable energy showplace. And on an unshakeable deadline to leave temporary quarters, BNIM latched onto a chance to occupy some recently vacated office space in Crown Center. It was not the vibrant Crossroads. Still, problem solved. But more than that, BNIM’s relocation and office renovation have brought a new focus to the sprawling, mixed-use complex on the southern edge of downtown. And it has sparked another evolutionary step in Crown Center’s identity. BNIM occupies one floor in the 2460 Pershing Building, one of the pre-cast and glass boxes that gracefully stair-step southeastward toward Hospital Hill and the Hallmark Cards headquarters building. It’s one of those unassuming modernist, office-park buildings that most passersby don’t give a second glance to. But it also represents the staying power of a corporate and architectural vision that began to take shape a half century ago. BNIM’s move is just the latest piece of Crown Center’s rethink. In recent years, the addition of crowd-pleasing family attractions such as Sea World and LegoLand; the consolidation and expansion of the Halls department store, complete with the unprecedented glazing of a formerly blank skybridge wall; the perennial event magnets such as the Mayor’s Christmas tree and the Kansas City Irish Festival; and a newly rebuilt ice-skating rink all speak to a change in the complex’s character from an introverted office park to an extroverted public gathering space. Outside the office building windows, daytime strollers head for lunch, read on benches or gather for impromptu meetings in the tree shade. It had never occurred to me, until speaking the other day with BNIM’s Steve McDowell and Hallmark/Crown Center’s Don Hall Jr., that we were looking out on one of the oldest and largest “green roof” developments in the nation, as McDowell put it. That’s right, all those trees, all that landscaping and all that people-friendly, fountain-wielding hardscape on the north half of the complex sit atop a parking garage built in the early 1970s for 5,000 vehicles. Among other alterations, BNIM plans to add to the five and a half acres of green space by converting a large blank rooftop outside its entry area into a landscaped patio. 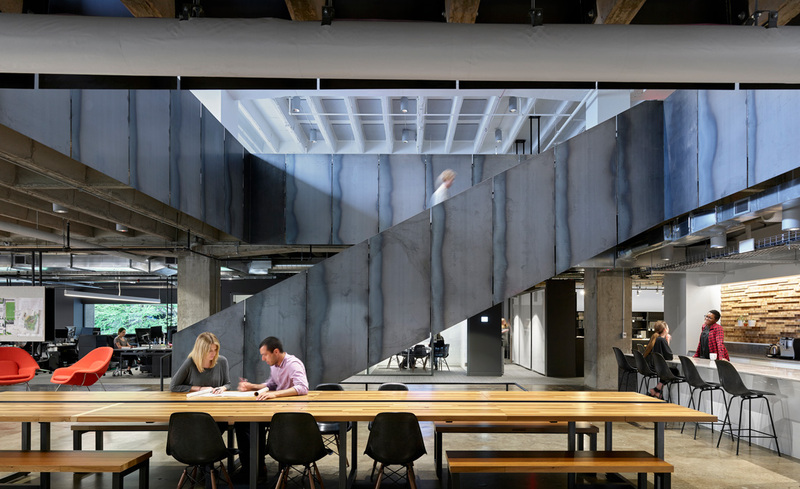 Inside, BNIM designed a wide-open workspace, mostly on one level, at the bottom of a dramatic, steel-lined staircase. Its staff of nearly 90 sit singly or in collaborative groups arrayed around a central area of conference tables, lounge seating, monitors and display boards. Natural light pours through three sides of the room, connecting the space to the city — hey, there’s the Liberty Memorial — and to a prominent stretch of treetops. Bicycles parked upstairs and down, plus a KC Bier Co. tap, speak to the ethos of BNIM’s increasingly millennial workforce. Models and displays reflect BNIM’s current projects for the University of Iowa, the U.S. State Department, an art building at Johnson County Community College and more. 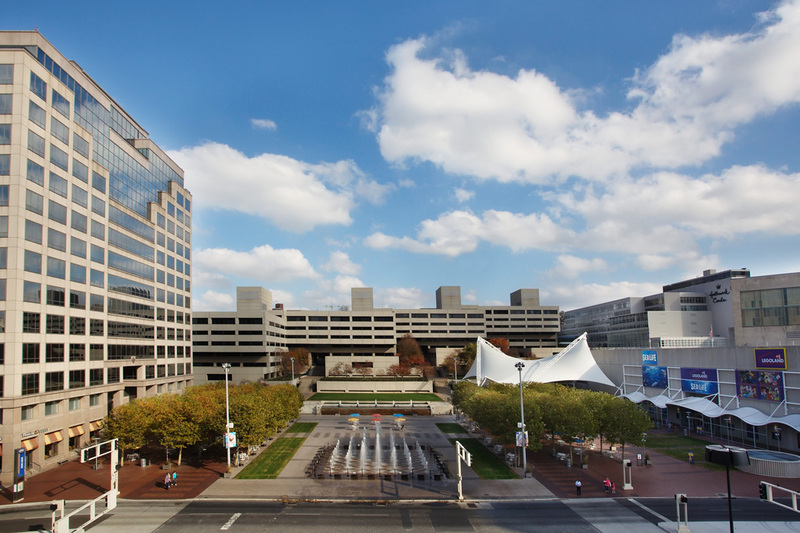 Crown Center was conceived in the late 1960s as a blight removal project as well as an investment in downtown. Hallmark Cards was intent on protecting its surroundings and flexing its development muscles. Its redevelopment arm cleared the rocky slope at Main Street and Pershing Road, a plot once known as Signboard Hill because of the proliferation of billboards that overlooked the intersection, and tore down a swath of mostly ragged buildings dating to the early 20th century. By the early 1970s, hotels, office towers and residential buildings began springing up on Crown Center’s 85 acres. New York architect Edward Larrabee Barnes, a onetime student of Bauhaus alums Walter Gropius and Marcel Breuer, was a master planner and designed the five Pershing office buildings. 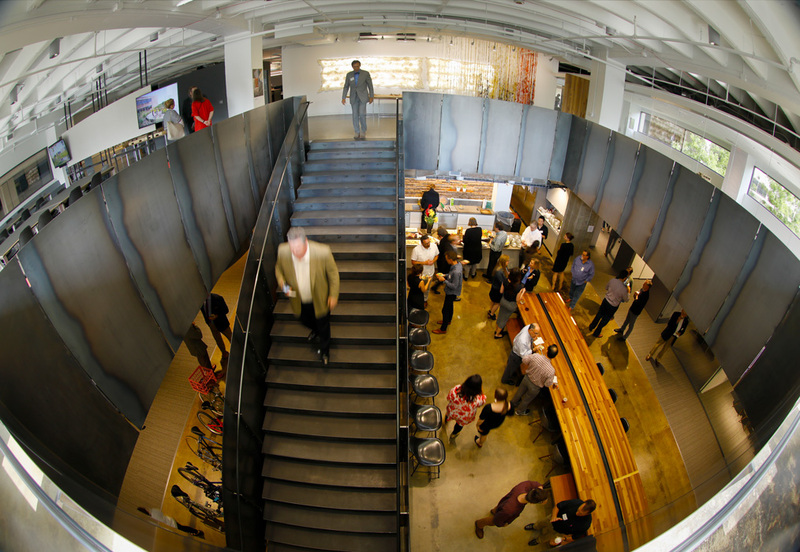 McDowell speaks of Barnes’ attention to detail with a kind of awe and a sense that his firm is carrying on a mission of thoughtful urban development embracing cost-effective materials and the like. Call it modernizing modernism. And Hallmark principals are fully on board, seeing a chance to upgrade offices made vacant when the greeting card company consolidated its once sprawling, now shrinking workforce into the headquarters building. At least one new tenant, with a space transformed by another A-List architect (Matthew Hufft), has already followed BNIM into 2460 Pershing. To Hall and the Hallmark operation, Crown Center, a private investment of many hundreds of millions of dollars in 50 years, is doing what was always intended when it was launched under the direction of his father, Donald Hall Sr.
Construction began earlier this year on a 361-unit residential complex — apartments, condominiums and townhomes — on an 18-acre tract, between McGee Trafficway and Gillham Road, that Hallmark sold to Milhaus Development of Indianapolis. Adding hundreds of residents to that southeastern stretch of Crown Center not only boosts its population mix but serves to connect it with a nearby development surge. Gaps are being filled in the adjacent Union Hill neighborhood and midtown districts to the south as well as Hospital Hill neighborhoods and Troost Avenue to the east. Enforcing a one-box move for its staff, McDowell and company took up residence in their new quarters Jan. 25. By day two, he said, everyone had unpacked, resettled and discovered that “the energy level is different.” It was a gratifying realization and a kind of healing rebound from the anxiety of the Crossroads setback. For McDowell, it has become a great learning experience in seizing opportunities wherever they arise. Steve Paul, a longtime Kansas City writer and editor, is the author of “Hemingway at Eighteen: The Pivotal Year That Launched an American Legend,” published this fall by Chicago Review Press. What a wonderful story about BNIM and how they take to heart their mission and also create beauty.